As a child in school, who didn’t love recess? As we get older it is so easy to forget the simple things in life that can bring us so much joy. 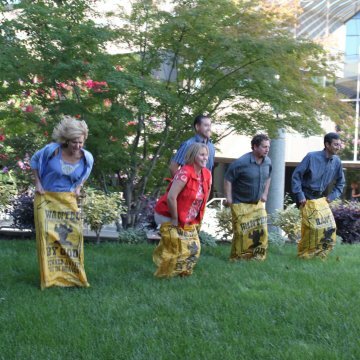 When Craig Wright asked the ENGEO Fun Committe to support his wife’s work campaign by participating in the KEEN® Recess Challenge, we knew we were in; it was just what the doctor ordered. On Wednesday, September 14, 2011, ENGEO pledged to always to play just as hard as we work. For 10 minutes we laughed and giggled while playing eachother in good old-fashioned games of hopscotch, four-square, sack races, and hand clapping games. If you missed recess today, no worries, there’s always tomorrow. Are you ready to take the Recess Pledge?